Sew Slowly: My brain's too full!!! I haven't been making 9 patches today, but for the perfectly good reason that it felt like time to put what I had into bigger chunks (nothing to do with lack of patience, short attention span, just a perfectly good, pragmatic decision). So now I have four 9x9x9 pieces. Now I really do have to get on with the squares. As it's Design Wall Monday I'm linking up with Patchwork Times again. Woohoo! I'm feeling the excitement over here too! There are so many possibilities, so many ideas... and I'm still really looking forward to seeing your newest 'unblogged' almost finish - come on woman, concentrate, haha!!! Hey, you're on a roll that's looking great! Looks good, I get that whirring thing in my head too, over stimulation I think, sitting in the jacuzzi for a while does help. I like the combination of circles and squares. Looking great... I really love the gentle colours! And, circles & squares together keeps it all interesting! I can think of much worse thoughts to wake up in the middle of the night to! How wonderful to feel so excited about your quilty projects - that's what the creative life is all about, isn't it? I am so loving how this quilt is coming together. It's just lovely. I like the tan/brown background with the teals and grays. It's going to be a very dynamic quilt. Isn't that the most wonderful thing to be so excited that it gets everything whirring around your brain?! 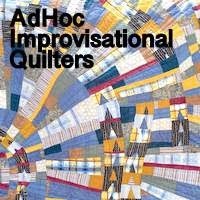 I'd be that excited too if this quilt was coming out of my imagination! Absolutely gorgeous, I'm looking forward to your finish of this one. Slowly getting a few moments to check out your whole blog posts. Thank you for sharing your beautiful work.